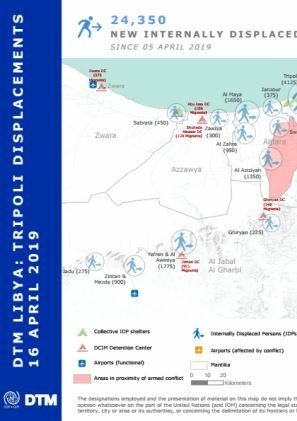 After the onset of armed conflict in Suq Al Khamis, Aziziya and southern Tripoli on 05 April 2019, at least 560 families (approximately 2,800 individuals) have been displaced to other areas in Tripoli, Msallata, Garabolli, Bani Waleed and Tarhuna, including 250 families over the past 24 hours. 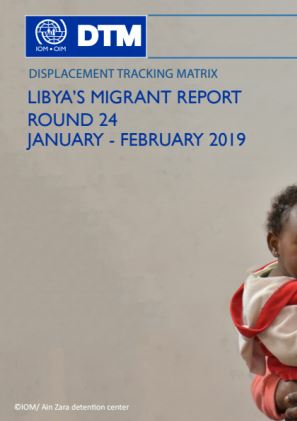 Displaced households left their homes in the conflict-affected neighborhoods of Qasr Ben Gashir, Ain Zara, Trig al Matar and Wadi Al Gharbi. 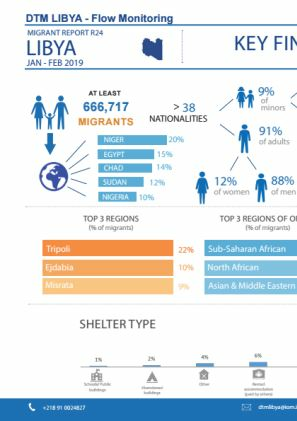 Most displaced families are reportedly staying with family in private accommodation, while around 120 IDPs arrived in two collective shelters in Tajoura and Ain Zara on 07 April.